Social media management is this thing I kind of fell into. Back when I was in college, Facebook wasn't a thing. We were happy to rip songs off of Napster and have deep conversations over AIM. But in then past 10 years, the internet has become a new playing field for businesses, organizations, marketers and the like. The internet is no longer accessed on a big desktop computer, either. It's mobile and at our fingertips, available on our phones, tablets, laptops. People spend a lot of time online, most notably on social networks. It's where we get our news, where we connect with friends, where we share important information. If we, as individuals, utilize the internet in this way, why not businesses? It wasn't long before brands caught on, creating their own Facebook pages and Twitter accounts. Today, if a business is not participating in the conversation on social media, they are irrelevant. Yet, many businesses, brands and organizations realized that while they were very good at in-store relationships and even tackling traditional marketing, they were out of their comfort zone online. But who do you get to help you with social media? What degree do you look for? Social Media Management wasn't yet a focus in college. You couldn't get a degree to Twitter. What kind qualities does a company look for when hiring someone to manage their various social media outlets, knowing that how they are presented on their mediums would make an impression on their customers? Well, they started looking for people like me: a solid writer with lots of social media experience. Bloggers tended to be early adopters of the social media movement, as it was their first line of defense in sharing their own content. So while you couldn't get a degree in social media, you could have a boatload of experience. Social Media Managers, or Community Managers, are quickly becoming important positions for companies and businesses to invest in. In my experience, they come alongside and work together in tandem with the marketing team to accomplish online goals for the business. Unfortunately, in many circles, it isn't yet a respected role. When I tell people what I do, I get that squinty look with a response like, "So you mess around on Facebook all day?" A Community Manager has to truly understand a business and its goals. There is strategy in what you write, how you write, when you share and how you share your messages across social media. There is data analysis. There is an understanding of online advertising options. There are pressures to meet marketing goals and to grow your online networks (while being trending, relevant and engaging). There is research: of what is happening in your company's industry as well as the social media realm (so you can always be on top of the latest and greatest). And, above all, you work hard to represent your company in a genuine way, capturing their voice in everything you post. Friends? If you want to work in the world of social media, you need to be on social media. This may be a no-brainer, but get involved and get networked. Consider your personal channels as a kind of resume to potential employers. It works against you as a social media expert if you have a measly following on your own networks. Work to build yourself, because in the process, you'll learn and have more to offer a client. It's easy to think that social media is formulaic and the equation for success can easily be applied across all industries. Except, it's not. I've managed a variety of businesses on Facebook. And what works for, say, a realtor may not work for a restaurant. The online voice of a dentist will sound very different from a children's boutique. It's important to meet (in person, if possible) with your direct supervisors or business owners to get a feel for the kind of presence the company wants to project as well as any goals (marketing or otherwise) they'd like you to help them reach. The better understanding you as the community manager has of the company, you're less likely to have miscommunication or a failure to reach initiatives. Community Management is a lot of research. First, as you get to know the business(es) you work for, you'll want to do ongoing research of their industry. What's happening in the news? What are the latest innovations? See what their competitors are talking about and engaging in. Become the expert on your industry. You also need to be an expert on social media. Which seems obvious. But knowing what is coming down the pipeline in terms of changes to the Facebook algorithm, terms of service for Twitter, and new networks being developed is imperative to keeping your social media efforts effective and successful. As you get to know your clients, you'll get a feel for their comfort zone of, and budget for, social media. Many small businesses can only designate a small portion of their budget to social media efforts, so you'll want to maximize what you can do for them within that budget. While Facebook does drive many community managers crazy (why does your algorithm and ever-changing reach numbers toy with our emotions, Facebook?! ), it's where a lot of the current population resides online. So, essentially, there is a big audience there. And while it can seem like a vacuum, Twitter is not to be ignored. Make sure your clients are up and running on these traditional networks. If their budget and desires allow, these 4 are worth investing in: Instagram, Pinterest, YouTube and LinkedIn. The great thing about a company blog is that it allows the business to be an online expert in their own industry. Instead of sharing great articles from competitors, they are creating the content and putting it out for others to read. Having a base for their own content also allows companies to tap into SEO (search engine optimization). What is SEO? Essentially it means ranking high on a search engine search. So, for instance, say you have a client who owns a coffee shop. And they write blog posts about the various aspects of coffee, coffee-making, coffee makers, coffee trends, etc. They post this and people read it. Google picks up on that the blog is a popular expert source for coffee. So it gives it an increasingly higher ranking on search engines. Ideally, the company would get within the first page search results. It will mean more traffic to the site. While it is important to know your company, it's equally important to know your audience. A community manager can post great content all day and night, but if their audience isn't receiving it, it's worthless. First, get a feel for what the audience responds to. Is it pictures? Videos? Questions? Learn what kind of content they want from you. Next, when are they responding to your content? If you always post at 12pm and 4pm but it's not getting any eyes (Likes, RT's, Comments, etc), then what is the point? Look at your back-end data (such as Facebook Insights or Pinterest Analytics) to see when when your audience is online and when they are most active. For other networks, it also works to just experiment with sharing content at different times of day (try early morning, late morning, early afternoon, late afternoon, early evening and late night) for several days. Keep a log and see which times do best. Work with those times for maximum results. The world of social media is moving to a more visual era. Back when AIM was in, we were amazed at simply getting a message of text to another person with our computers. We've come a long way, and social networks are capitalizing on our draw to images as well as videos. Videos rank high in the current Facebook algorithm, and Twitter has recently enabled video sharing via tweets. Instagram has a native video application and Pinterest has worked to integrate it as well. Learn to take good pictures for your clients or, if you are like me, know your limits and partner with a solid photographer. Showcase your clients in pictures, as these catch the eye immediately in a newsfeed or timeline. If your client is willing, make videos. You may not be a videographer (nor may it be in your company's budget), but apps such as PartyParty make it easy to take photographs and turn them into .mov or .gif files, which will have the same effect on social networks as an actual video will. 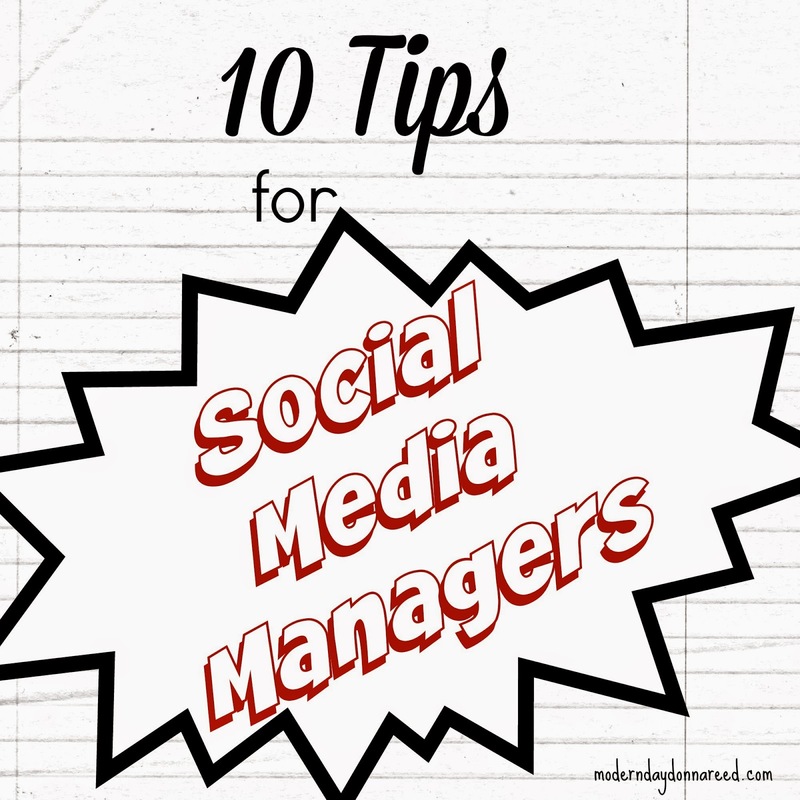 You will be more marketable as a Community Manager if you can vary your skill set. And while it may not be important to all businesses, it's worth getting to know how advertising works on social media, as well as analyzing data to create reports for your clients. Some businesses don't care to advertise online or get reports, but others might. And having these skills will give you an edge on other candidates. Gone are the days where people fill out a customer satisfaction card or spend time making a phone call to share their thoughts with a company. Happy and disgruntled customers alike know that the most public way to share their thoughts is via social media. Community Management isn't just writing and posting content. It is managing and maintaining customers and fans. This means responding to comments and messages, however inconsequential they may be. For larger businesses and certain industries, you will deal with addressing comments, messages and tweets that are of a customer service nature: a bad meal, unhappy with purchase, food poisoning, bad service, etc. You have to work with your company or team to have a response to such posts. It's important for the customer to be HEARD but also to get the conversation off the public timeline. Take the conversation to private messages or DM's, and get contact information so the owner or manager can reach out personally. Responding is so important in social media. Just the fact that a community manager will respond (preferably quickly) to any post or tweet sets your company apart from the majority of businesses on social media that do not. Yes, it is fun to "play around" on Facebook and Twitter. But having the social media of an entire business, however large or small, in your hands is a great responsibility. Not taking your job seriously does not only impact you, it impacts the reputation of a brand. We've seen what happens when community managers are not careful with what the post, both on their business's networks and their personal networks. Take pride in your work and, above all, be careful! Check that you are logged in to the right account when posting. And post content that is well-written. I love writing, but I am pretty terrible with grammar. Luckily, I have worked with an editor on several of my clients and it makes a world of difference (also - she challenges me to be a better writer)! So are you ready to dive into the world of Community Management? What other questions do you have - leave a comment and I'll try my best to answer. For current Community Managers, what tips would YOU add? Leave a comment - I'd love to add your insight! For more information on managing a Facebook Page, check out my Increasing Facebook Interaction series. Want to work with me? You can find my information on my Contact Me page.